As I look out my windows this morning, it is snowing like crazy, but the beauty of the snow belies the very cold temps that we are experiencing here in Minnesota. It’s hard to explain to our little Aussie just why it wouldn’t be much fun to play outside. But it’s a wonderful day for finally having time to sit down and catch up on my blog. Somehow Christmas 2014 has come and gone, along with my birthday, two of my best friends’ birthdays and my youngest daughter’s birthday(New Years Eve! ), and of course New Year’s Day 2015! For those of you who celebrate other traditions, that would include the passing of another Hannukka, Kwanzaa, and winter solstice; I love the opportunity to learn about other traditions than my own. I think they give us all a chance to add joy and meaning to our lives without having to sacrifice any of our own – and in the long, cold, dark season of winter, we can use all the joy we can get! As I look forward to another year, I do want to share some of the projects that I completed for Christmas – I couldn’t share them before as certain recipients would have found out just what was coming their way! Quilt label with original drawing background! 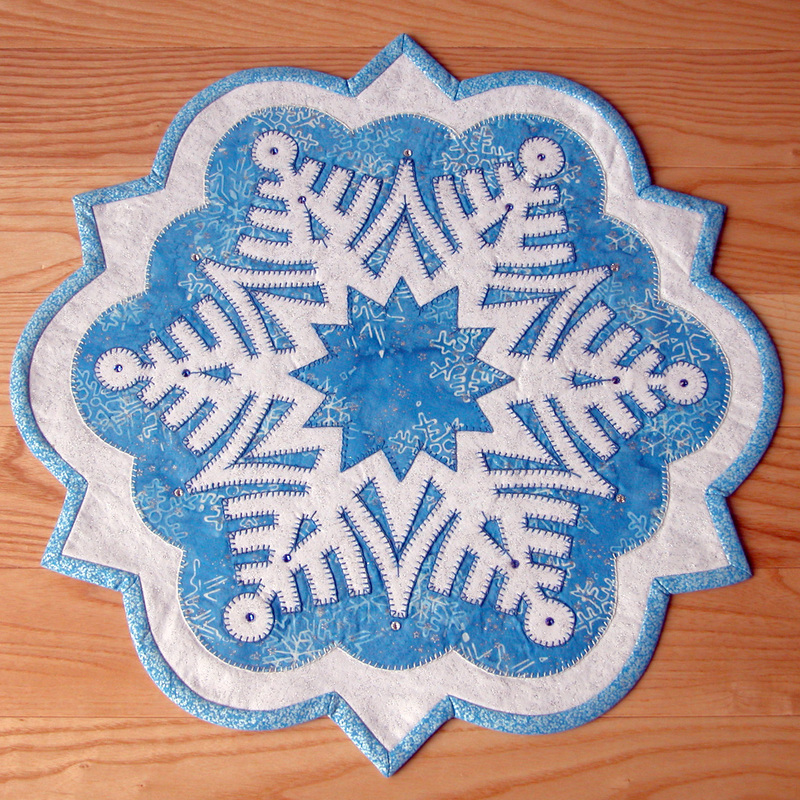 For some time now, it has been a goal of mine to make up one of my table topper patterns in regular quilting cottons. Given the fact that one of my best friends is allergic to wool, I thought that this might just be the perfect excuse to not put this off any longer. Rose and I have known each other since my husband and I ‘brought her home’ from high school to be our babysitter! We hit the jackpot! 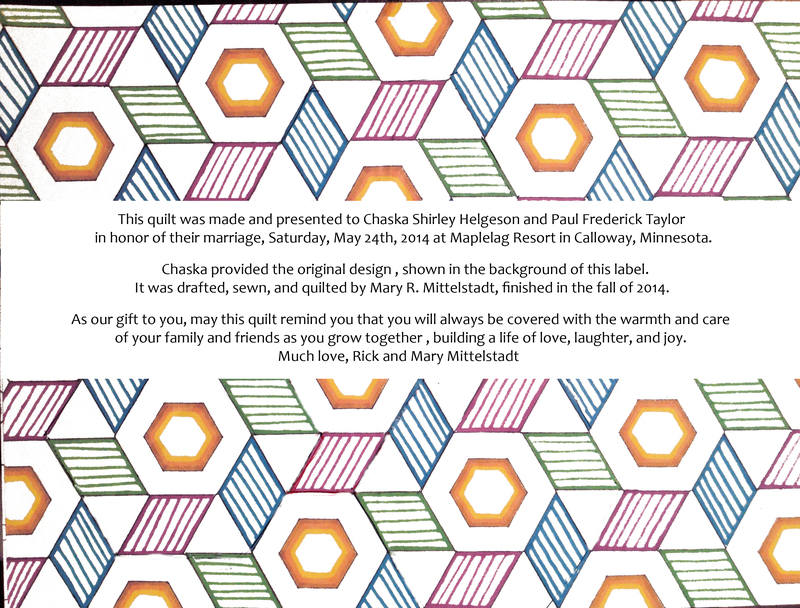 As the years have gone by, Rose took care of my kids for years, went on to study art, married and moved to Colorado, and started a successful online quilting business – through it all we have become dearest friends (neither Rose nor I have sisters!) We often laugh as we figure that it’s probably a good thing we don’t live closer to each other because of all the crazy mischief we could get into! Anyhow, we have exchanged Christmas/birthday packages for years (get this – we have the same birthday!!). So here’s the piece I made for her, it’s even got a bit of bling to it, with Swarovski crystals. 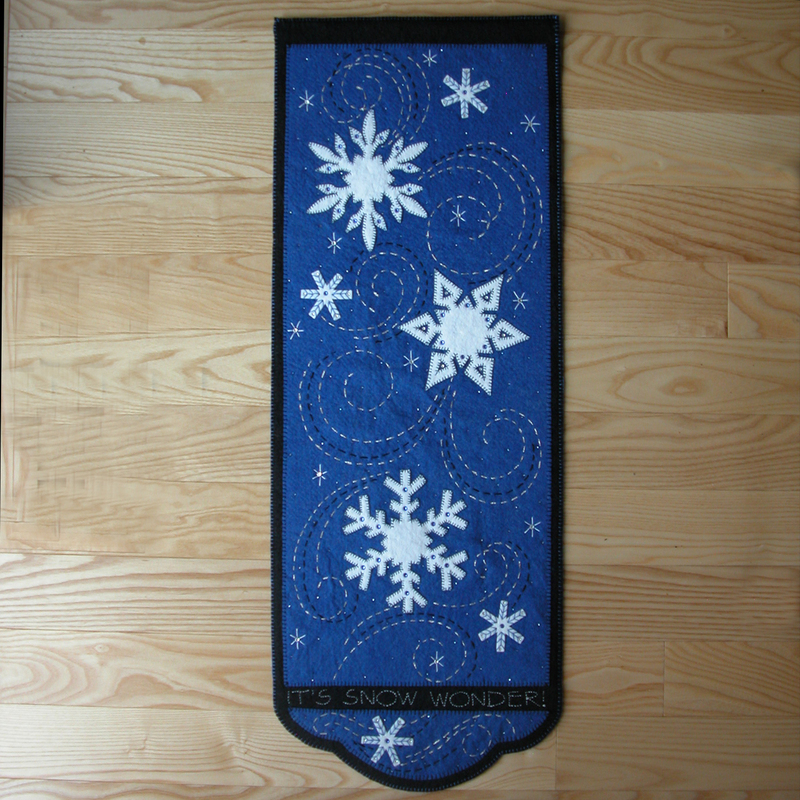 I loved the blue, sparkly, snowflake fabrics I used, especially since you can keep them out well past the Christmas season. 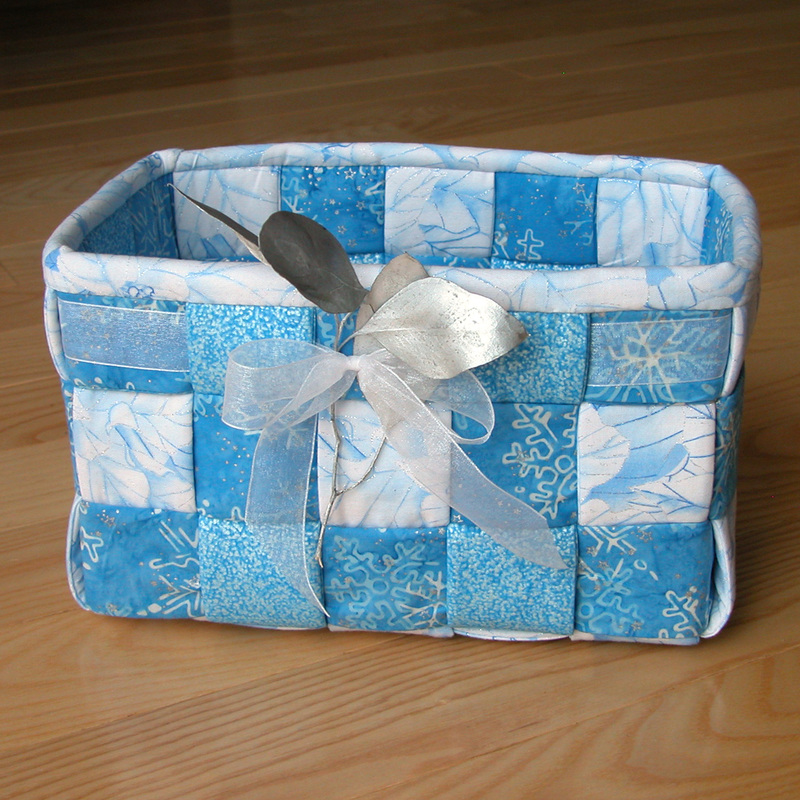 In the last photo I used the same fabrics to make this basket – made from a pattern (Aunties Two Patterns) I picked up at the Sewing Expo show that came to the Twin Cities in early November. Was kind of nice diversion from the projects I’m usually involved in! 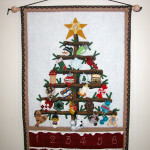 This next project was one that I worked up in November. I wanted to capture the delight of falling, swirling snow – in the evening or early morning dusk – using my small snowflake designs. 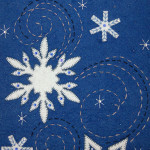 Other than the blanket stitching, the running stitches work up very quickly. I tried a number of ‘heavier’ metallic threads and found several that worked well – Frye Works metallic ribbon, Kreinik metallic heavy braid or ribbon, Superior threads Razzle Dazzle. I also had fun adding the Swarovski crystals and the spot beading, all for twinkle! I would like to do another one – probably in a lighter color (daylight snow?!?!). And since this one is wool felt, the next one will likely be in felted woven wool. 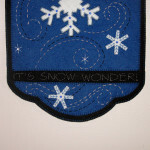 I also experimented with the lettering (the addition of ‘It’s Snow Wonder’ was really an afterthought). I ended up using Sulky Iron On Tear Away Stabilizer which worked fairly well. Personally, I might have used a white marking pencil and drawn the letters on, but I think most stitchers prefer to have something they can trace or copy. The person who comes up with a transfer marking system for dark wools will be a millionaire!! 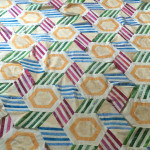 I’m also toying with whether I can ‘multi-purpose’ this design – or part of it – for use as a pillow. Stay tuned! 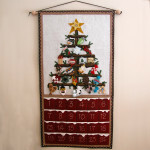 Here’s a bit of an update on the Yule Tree Calendar. These photos show the finished edges as well as a close up of the tree – with the buttons used for hanging the ornament shown. Due to the interest in this project, I am working on the details of how to produce this as a pattern. 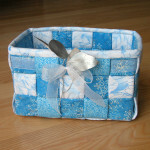 This is not a quick project, so it is definitely for those of you who like to create keepsakes! Please see my previous post for more photos of ornaments, etc. 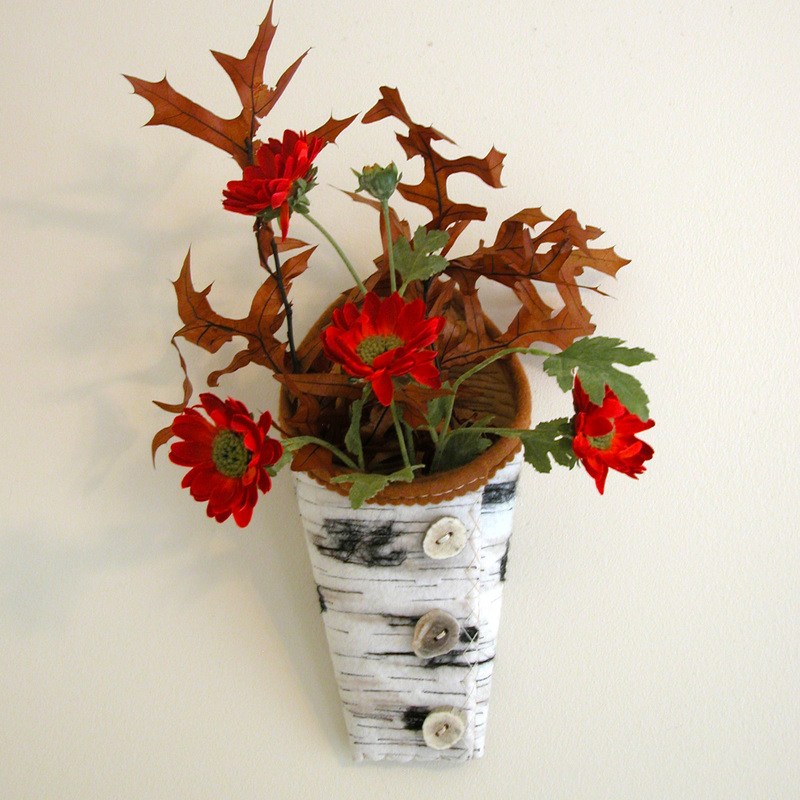 A few miscellaneous projects…I’m not sure where the inspiration came from, but I had a lot of fun making wool felt look like birch bark! (See the photo on left below). 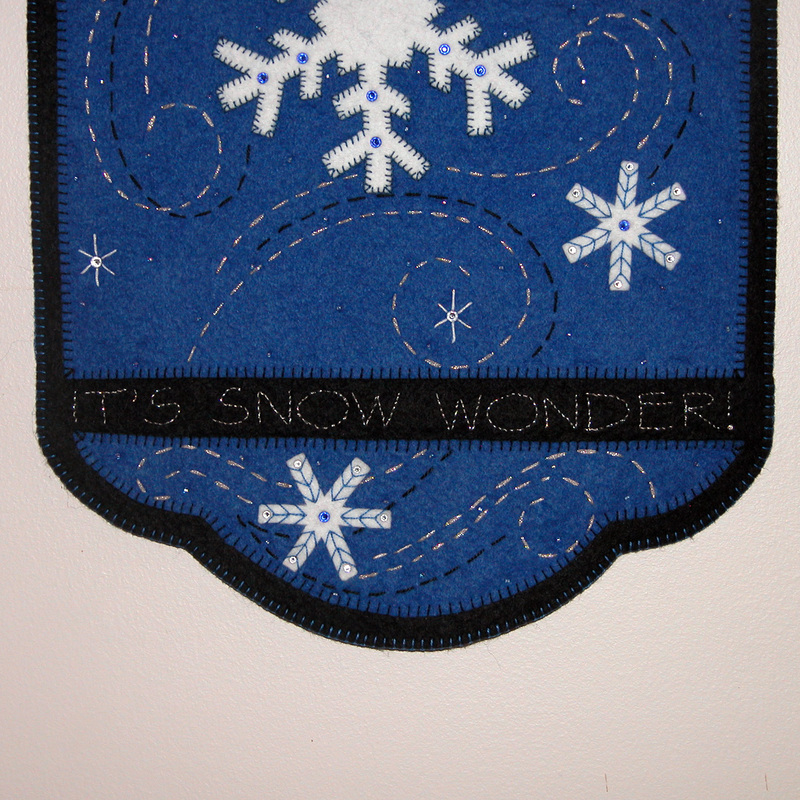 With some very heavy fusible interfacing, two colors of wool felt, two colors of thread, some wool roving, and a few hours on the sewing machine, I created these wall pockets as gifts for my brothers as well as my children. 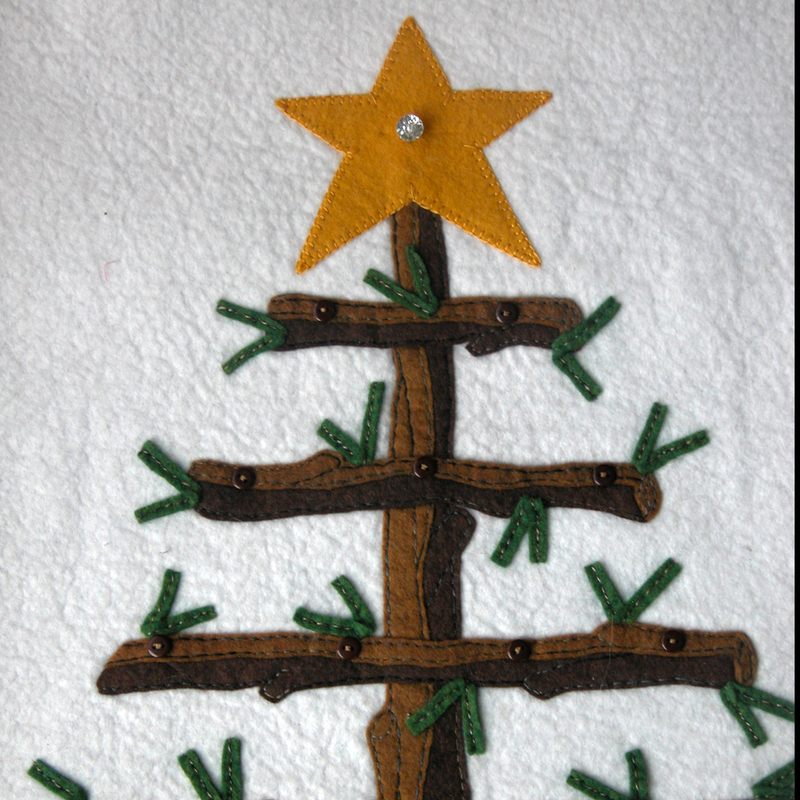 This photo is of one of the ‘early’ ones – in later ones, I used raffia for sewing the edges, deer antler for the buttons (yes, my DH cut up a deer antler I had picked up at a shop in the Black Hills! ), and some ultra suede for the trim. From across the room, people didn’t realize they weren’t the real thing! Pure fun! 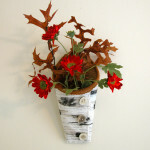 I have an idea for a birch wall hanging…!! 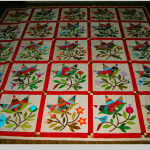 The middle photo shows a top that I appliqued/pieced and am currently hand quilting. 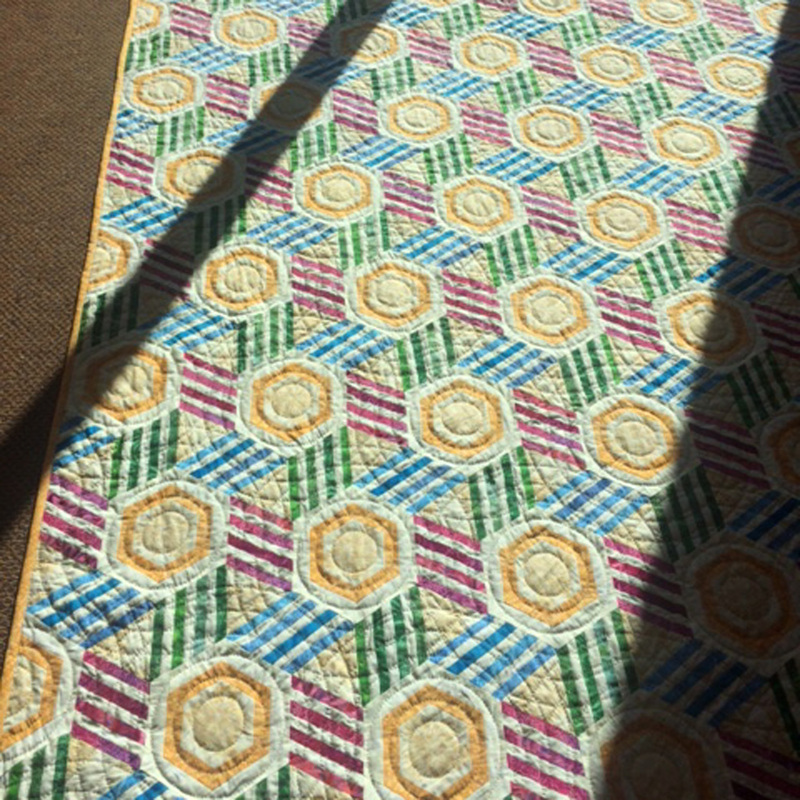 The photo colors are a bit off, but it is a colorful rendition of a Laundry Basket quilt pattern – Prairie Peony. Since I’ve spent the last couple of years focusing on wool/wool felt, I am determined to have a ‘regular’ quilt to enter in a few shows this fall, especially since our quilt group is going to sponsor a show later this fall. The last photo on the right, was my latest find; I was actually looking for pastel wool yardage and was disappointed not to find any. BUT, this is what I ran across! I’ve learned that if you find wool you like, get it while you can, because it may not be there in the future! So now I will have wait till the next month to go after the pastels I was looking for originally!! Budgets! Can’t live with ’em, can’t live without ’em! So now I can look to the new year! I am the type whose mind never quits producing new ideas, sometimes resulting in an ‘overload’! 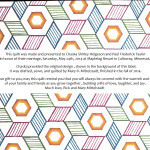 The pattern for the calendar is on the list, along with a show of my work in March/April/May. 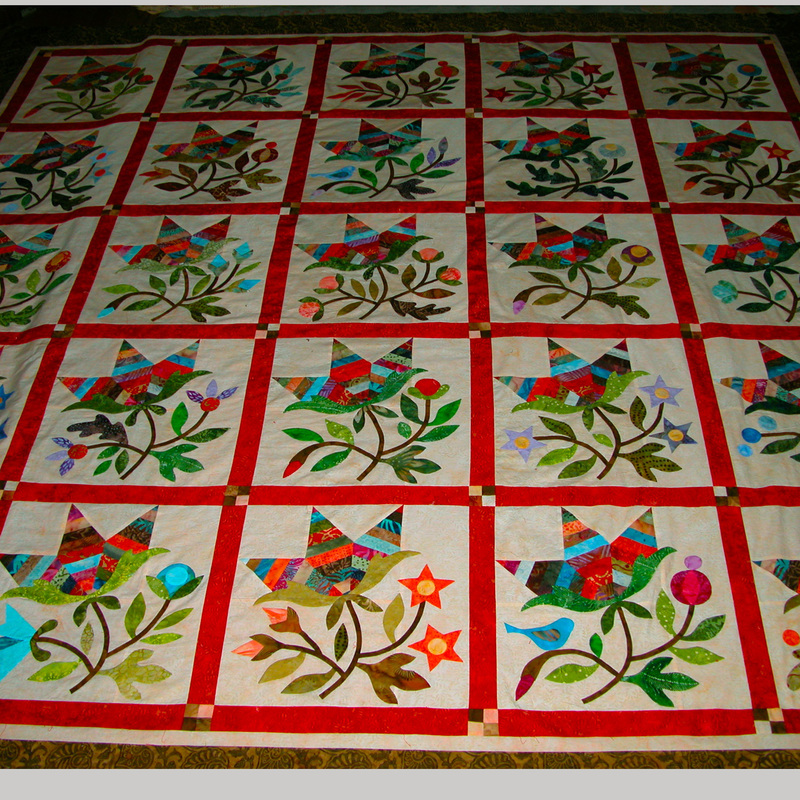 Then there’s the Prairie Peony quilt to be quilted and finished, along with the Barbara Lavallee quilt kit of Ladie Ice fishing that I brought back from Alaska in 2011. 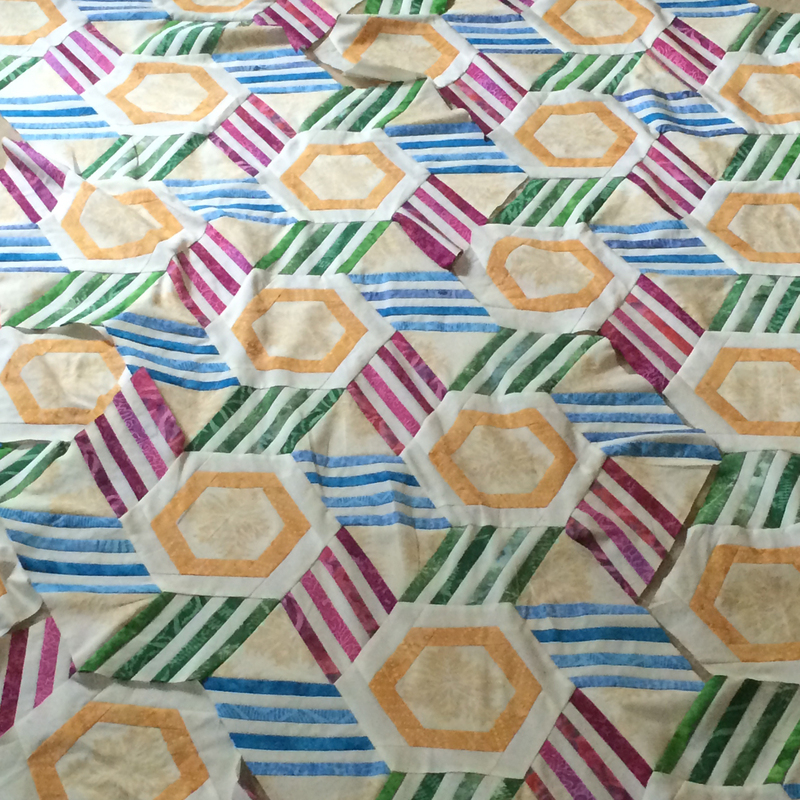 Not to be left out is the beautiful Cabin Fever quilt(Neimeyer) pattern that I brought home from a presentation at my quilt group – What was I thinking? I don’t have enough projects in queue?!?! Oh well, better to be busy than not!! I should’ve known — my mother, who wrote faithfully in my ‘baby book’ (remember those?? ), observed that even as a toddler I was ‘busy’ all the time and she rarely had to occupy me!! So stay tuned for glimpses of what’s next. Meanwhile celebrate the new year with some good ‘stitchin’ time! 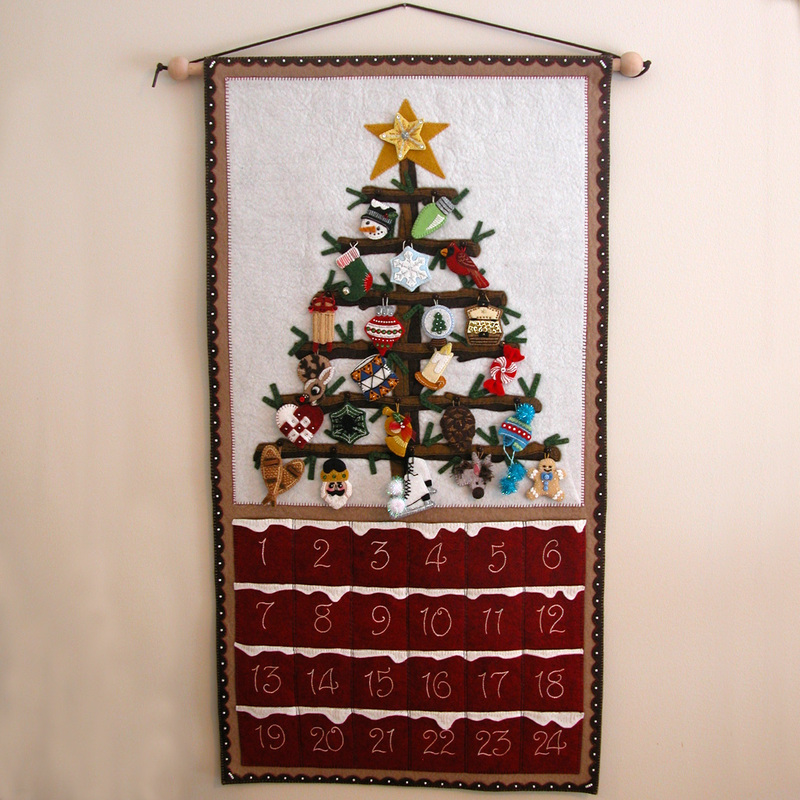 Love your advent calendar! I look forward to seeing the pattern…I will be one of the first in line to buy it. 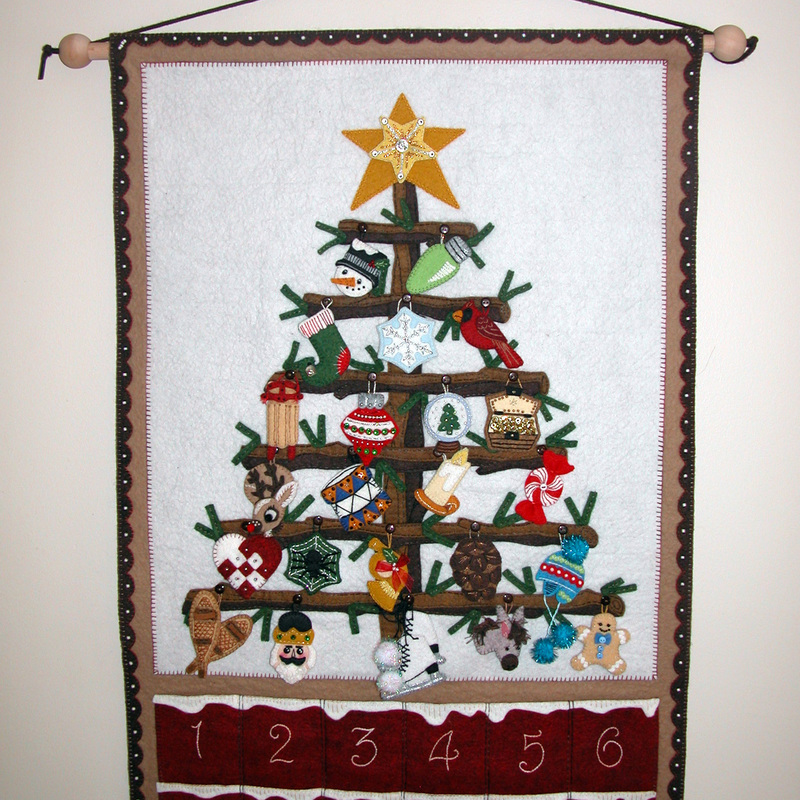 My grandchildren would love it, You are so very talented. Thank you for sharing that talent! Thanks for visiting Lorna! The calendar is hanging on the door right by my computer – reminding me what needs to be done! I’ve finally gotten the Christmas decor down and put away (well, mostly..) and I’ve had to address a few personal projects that have been waiting for attention for several months. And I actually have a small showing of my work at the Owatonna hospital healing art’s program, so I have been working to get that together. 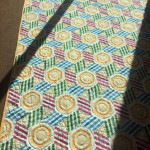 Easier said than done, as I have to reserved enough pieces to display with National Non Wovens at the spring quilt market in May. Plus I’ve had to figure out how to hang so many circular items! Some days it seems like I end up doing all kinds of (necessary)things, except for the thing I like best: designing, stitching, quilting, etc.! I’m sure I am not alone in that 😉 BTW, I love the name of your blog – ‘quilted hug’ – a perfect description of the love most of us put into our work! I also noticed that you are from Wisconsin – while I have lived most of my life in Minnesota, I was born in Wausau and have family all along the way from Wausau to Boyd/Chippewa Falls/Eau Claire area as well as Milwaukee: so I guess a little part of me will always be ‘Wisconsonite’!! Although I must credit my mother with teaching me most of my sewing/handworking skills, I learned a good amount from my Wisconsin relatives! Oh Judy – it always is nice to know I’m not the only ‘nutty’ one when it comes to all things winter! While I certainly don’t enjoy those times when our wind chills and temps dip to -20 or -30, I DO enjoy winter. I also have compassion for those who have to get out each day and start a cold car and negotiate the roads to get to a job – NO FUN!! But then again, there is the joke that it ‘keeps the riff-raff out’ (although I’m not totally sure of exactly what that was meant to describe!!!) It does help to figure out a way to be able to get out and somehow find an activity to enjoy oneself. We have a little Aussie – that’s Australian Shepherd for those of you non-dog persons – and as a ‘high energy’ dog, we try to take her regularly to the dog park, so all of us get our exercise. [Not sure what possessed a low energy artist to get a high energy canine! 🙂 ] Watching her joy at being off-leash and visiting with others helps us to not notice the cold – at least not as much! All that said, I love it when it snows (it’s a standing joke in our family that ‘mom’ always asks for snow on her birthday (early December); I still will sit and stare out at the falling snow whenever I get the chance. 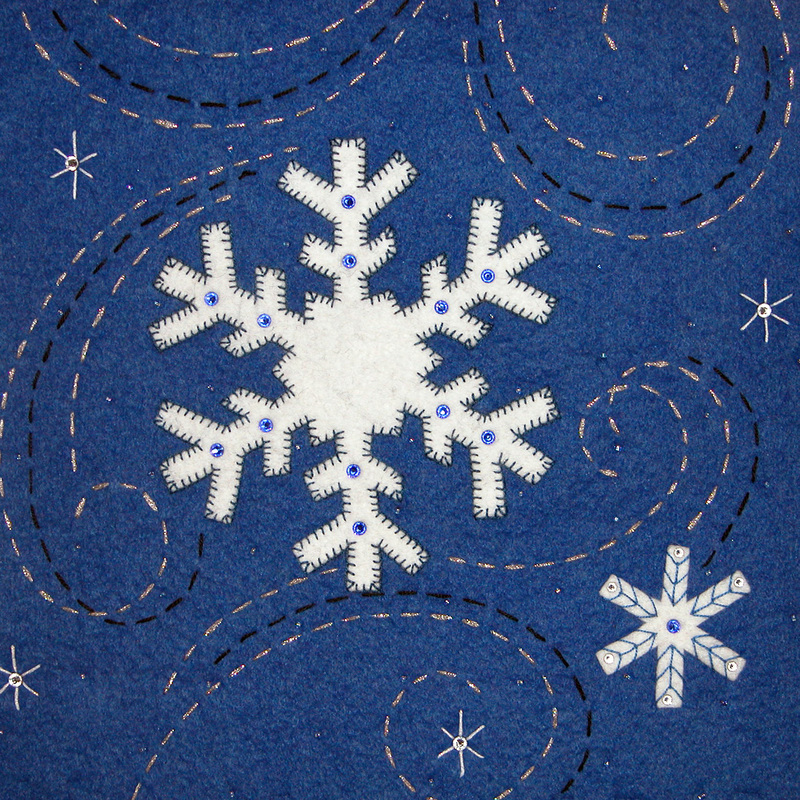 So I guess designing snowflakes was bound to happen. It’s just frosting on the cake when others enjoy them as well! Thanks for visiting! 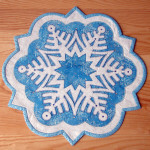 I love your snowflakes and your big stitched swirls are the icing on the cake!! Thanks Paulette! Glad there are other ‘snowflake lovers’ out there! And those big swirls were so fun to stitch and went so fast compared to the blanket stitching areas! 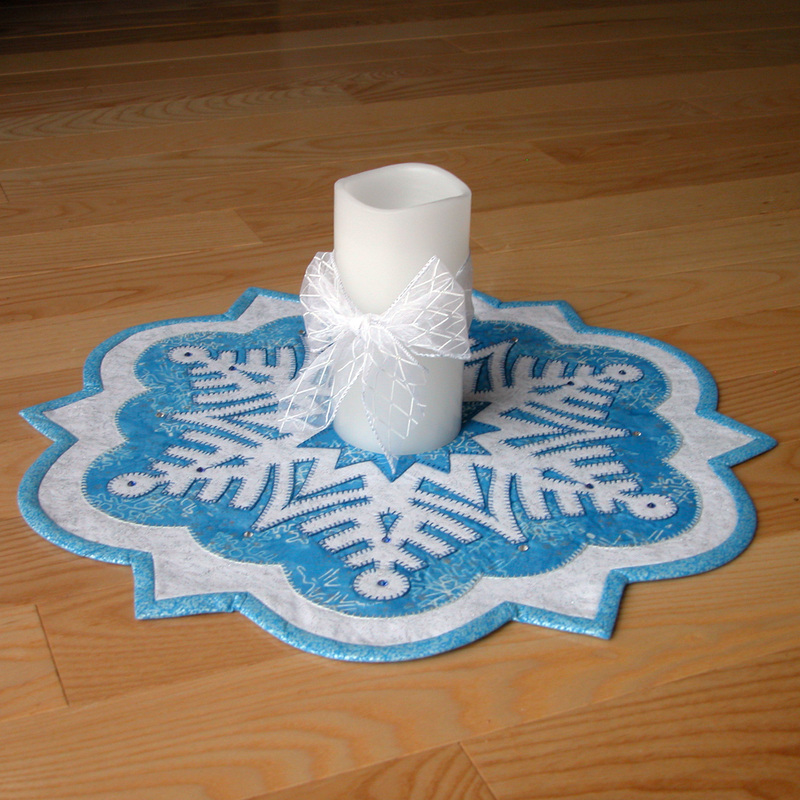 I just cut out the woven (felted) wool version: I finally found a light blue wool at Dorr Mill so I washed and pressed it earlier this week along with the almost white wool I am using for the snowflakes. It always seems to feel a bit redundant to make a second one of each design, but it seems to satisfy those who really prefer either one material over the other(woven wool that is felted vs. wool felt). Personally, I’m happy to work with both: they each have their qualities. 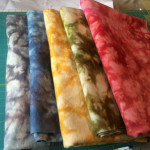 While the swirls are fun to do – and very forgiving in regards to stitching – the real difficulty always comes with how to transfer the lines to the wool! I’ve said it before and will say it again – The person who can invent a transfer pencil in white, to work on dark wool will be a millionaire!! With my background in art I tend to do a good bit of freehand marking, but most persons want more guidance in their placement. So I have developed a system where I poke small holes along the lines (of my pattern) and then go back and draw from dot to dot, if you will. I recently picked up some marking pens for darks, but they do not address the issue of transferring! I’m thinking that once I finish this second model, this design could also work with swirling leaves – so maybe this will be written as a ‘two-fer’ pattern!